In some ways the lady who we are privileged to profile today needs no introduction. For close to fifty years her rich melodic voice has been singing Canadians through happy and hard times, vicariously sharing the joyous moments of their lives and offering comfort in the sad and lonely hours. By now her voice and songs are part of the country’s musical fabric, tightly woven into our hearts and lives. Unlike so many of her predecessors and contemporaries she managed to make history by becoming a major international success as well as being loved at home, and all while promoting and embracing her Canadian identity. The ladies of Canadian music who followed in the path she boldly blazed, from Celine Dion to Sarah McLachlan owe her a thank you for having been the first to conquer that climb. For close to fifty years Anne Murray has done exactly that, sung to us, bringing us love and sharing her unique voice and love for music with the world. was the flip side of the second single released from the album, This Is My Way. With its simple poignant lyrics and contrasting, bright, fast paced melody it quickly became a success at home in Canada, and soared to hit status in the U.S. It was the first ever American gold record to be awarded to a solo Canadian female! From this beginning Anne herself soared, and we’ve treasured her and her beautiful voice ever since. 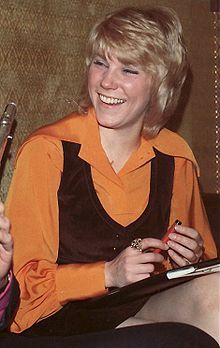 Morna Anne Murray was born on June 20th 1945, in the small coal mining town of Springhill, Nova Scotia. Anne was one of six children, and the only girl. From a very early age she learned the value of determination and persistence (a necessity to hold her own with her brothers), traits that stood her in good stead in the years to come when facing the challenges presented by the music industry. Anne attended university in Nova Scotia then studied physical education in New Brunswick. She then taught for a year. After her early successes Anne moved to Toronto to pursue her music career full time. In 1975 she married Bill Langstroth and together they had two children, son William born in 1976, and daughter Dawn born in 1979. Throughout the 70s and beyond, her musical star continued to rise. Such songs as “A Love Song“, “You Needed Me“, “Could I Have This Dance” (one of the most requested songs at weddings to this day), “Danny’s Song“, “I Just Fall In Love Again“, “Shadows In The Moonlight” and “Just Another Woman In Love” along with her covers of such songs as Gordon Lightfoot’s “Cotton Jenny“, the Beatles “You Won’t See Me” and the Monkeys “Day Dream Believer” continued to grow her reputation, a reputation that has grown into a legend. After more than forty years her songs still have air time and she has rarely been off the charts. 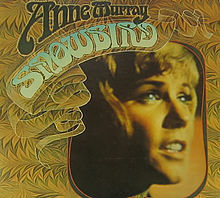 Her first hit “Snowbird” was covered by artists from Elvis Presley and Perry Como, to Andy Williams and Loretta Lynn. Her appeal to her peers has never faded. In 2007 she released a compilation album in which she sings duets with present day stars such as: Shania Twain, K. D. Lang, Jann Arden, Emmylou Harris, Martina McBride and Amy Grant. To date her albums have sold close to fifty million copies. While the songs she has chosen to sing frequently have moving lyrics, it is something indefinable in the heartwarming quality of Anne’s clear lovely voice that makes her so unforgettable, and that has planted her permanently in our musical consciousness. Since the first fire storm of publicity generated by “Snowbird” through to 2010, Anne has delighted us with public appearances and performances. She has appeared on many television shows, from The Oprah Winfrey Show and Good Morning America to 20/20 and The Tonight Show Starring Johnny Carson. 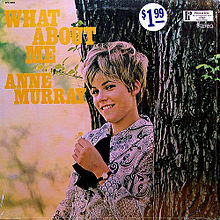 She gave us the memorable Christmas specials: A Special Anne Murray Christmas and Anne Murray’s Classic Christmas. In addition she has had five highly rated U.S. specials on CBS (with more than forty million viewers tuning in to each one), and several specials on CBC including: Anne Murray In Nova Scotia, Intimate Evening With Anne Murray and What A Wonderful World to name only a few. On April 7th 1977 she performed “O Canada” at the first American League baseball game played in Canada when the Toronto Blue Jays played the Chicago White Socks at Exhibition Stadium. Later she reprised the Canadian national anthem prior to Game 3 of the 1992 World Series at The SkyDome. And memorably , from centre ice, wearing a Toronto Maple Leaf’s jersey, she concluded the arena’s closing ceremony by singing “The Maple Leaf Forever” after the last game played at Maple Leaf Gardens. On February 12, 2010, Anne Murray was one of the eight Canadians who carried the Olympic Flag during the Opening Ceremonies of The XXI Winter Games in Vancouver British Columbia. Over the years Anne recorded an impressive 32 studio albums, 15 compilation albums and 76 singles, out of which seven albums and thirty-three singles charted at number 1! 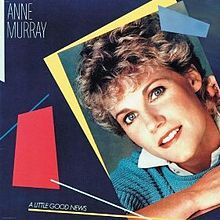 Added to those chart toppers Anne Murray has received four Grammys (including one in the pop category), three American Music Awards, three CMA Awards, and a record 24 Juno Awards! She was also the first woman and the first Canadian to win “Album of the Year” at the 1984 CountryMusic Awards for her Gold-plus 1983 album A Little Good News. In 1995, Anne received a Governor General’s Performing Arts Award for Lifetime Artistic Achievement, Canada’s highest honour in the performing arts. In addition she is a Companion Of The Order Of Canada, the second highest honour that can be awarded to a Canadian civilian. She was also a recipient of the Order of Nova Scotia in its inaugural year. “She has been inducted into the Canadian Country Music Hall of Fame, the Juno Hall of Fame, and The Canadian Songwriters Hall of Fame. She is a member of the Country Music Hall of Fame Walkway of Stars in Nashville, and has her own star on the Hollywood Walk of Fame in Los Angeles and on Canada’s Walk of Fame in Toronto. On June 29th Canada Post issued a limited edition Anne Murray stamp, making her one of only two female recording artists to appear on a stamp. Within two weeks of the book’s launch it had become a best seller on the Canadian Non-fiction list, and it kept a top ten place for the next two months. Frankly I do not believe a single book can do the life and experiences of this Canadian icon justice, so it is impossible to do more than give the barest thumbnail sketch of her achievements in a mere blog post. However, there are some excellent websites out there packed with information about Canada’s Songbird and we have listed a few including the two we have quoted from (they were of the most help in putting this article together) below.